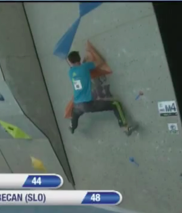 Semifinals are 4 problems per category and men and women climb at the same time. 20 women and 23 men (due to ties in qualis) are in semis. They’ve stopped giving approximate grades for the problems, which makes sense to me because in the past they give grades and then people who don’t understand what it is like to try and flash 4 or 5 brand new, extremely technical, powerful, and often confusing problems in 4-5 minutes each, with little rest in between, and the pressures of all the spectators, changing weather conditions, etc… not to mention doing this for up to 3 rounds in 2 days, have made some insulting insinuations online about the athlete’s abilities and comp difficulty. Obviously these comps are very hard. Each problem is very hard. 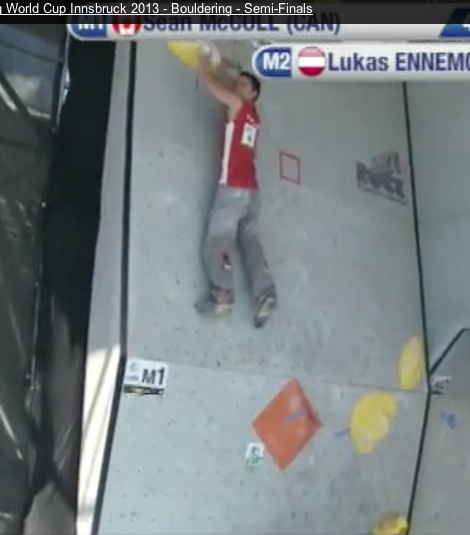 These athletes are some of the best in the world, as you can see if you look at the outdoor ticklists of many of the top competitors. When you hear a grade of 7A+ (~V6), 7B (V7), 7B+ (V8), or 7C (V9) for a comp problem, you might think “I could do that”. And maybe you could. But what if that problem wasn’t your style at all? Imagine the hardest problem of that grade you’ve climbed. Imagine going somewhere like Font, where everything demands precision and balance–there are easy easy problems that double digit climbers will fall on over and over. 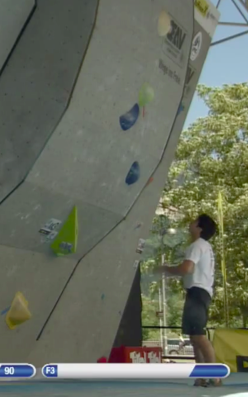 Imagine encountering holds, volumes, and wall angles you’ve never seen before on every problem. Want to simulate the physical aspects of a comp like this? Go into your gym and pick 5 brand new problems of a grade that is moderately challenging for you, look at them briefly, then walk away from them and warm up. 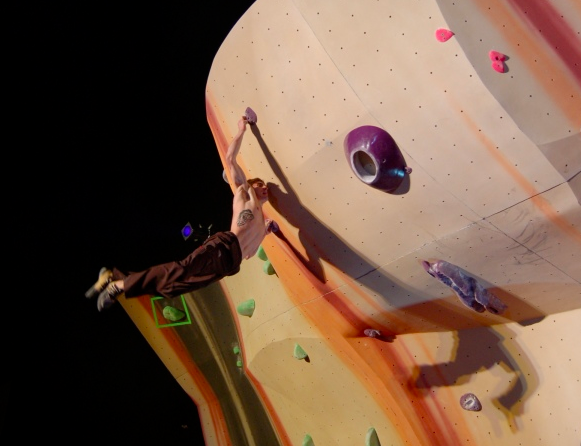 Come back, give yourself 5 min on, 5 min off to climb those problems one-by-one. The next day, go back in the gym and pick 4 more problems. 5 min on, 5 min off. Two hours later 4 more problems, 4 min on, 16-20 min off. If you’ve left the ground before your 4th minute is up you can continue til you fall. Try to flash or finish all of ’em. See how you feel. Next time you hear or read someone writing something insulting about the difficulty of these problems, set them straight. Climbers need to band together to help progress our sport, and these men and women are super strong and work very very hard to be where there are. I, for one, appreciate the work they put in and the entertainment and inspiration these comps provide. End rant. 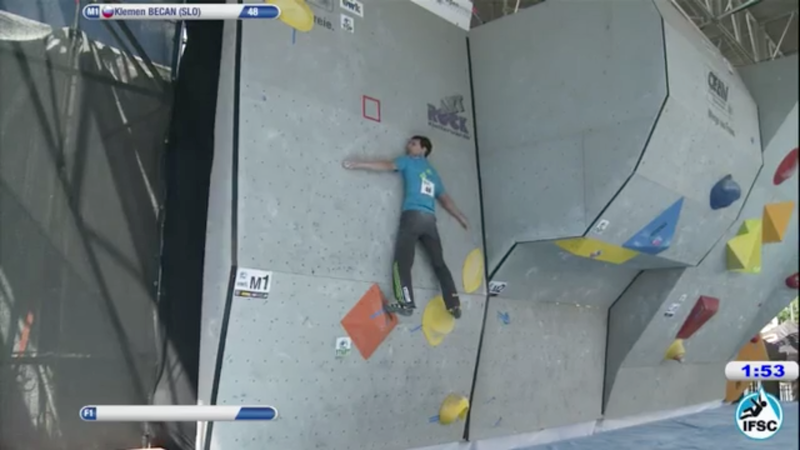 Chris Webb Parsons was too ill to compete in qualifiers yesterday, but he seems to be feeling better today and he’s commentating on the live feed, which is always nice as he’s got in depth knowledge of the climbers and the intricacies of competing in an event like this. 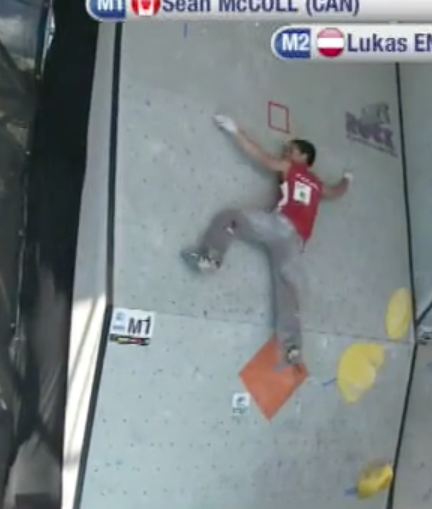 He commentated on most events in 2011 and it made for an excellent live feed. I’m sorry for him that he’s not in the comp, but as a viewer I’m glad he’s back on the feed. 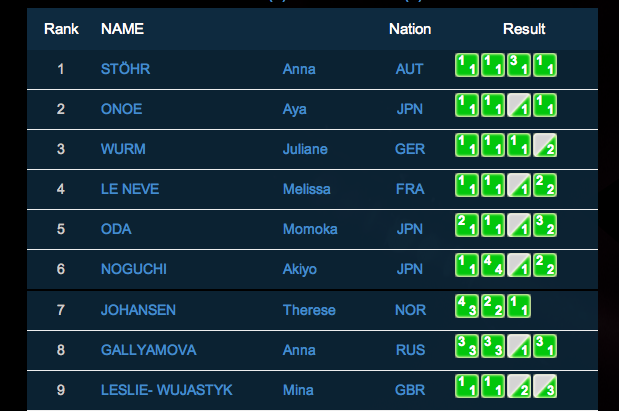 From the results it looks like semis were a tough round for the setters and the climbers. Top 6 go to finals. Problem descriptions, results, and commentary below. Therese Johansen on Women’s Semi 1. Thuggy up volumes. Tricky to stand on slopey red volume at the bottom. Therese suffered but finished. Most climbers were able to climb this one in short order. Another thuggy looking problem. Start on volume. Grab red sloper. 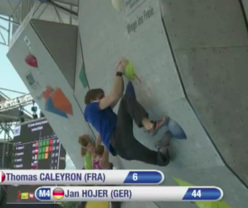 Weird body moves/balance and then pop left to 2nd red sloper. Catch. Hand-heel right. Right hand to other red blob out left. Up to crimps atop blue volume. Up to other red blob. Top. This problem looked the coolest to me. Two huge volumes. Stand up on the right one (yellow). 1-2-3 jump to a volume straight up and a left hand finish. From here she’s supposed to quickly match orange and pop left to the good hold on blue before she falls out. Katha wasn’t able to finish this one. Only Anna, Jule, and Therese did it. Some kind of mantle here to get to orange. This girl wasn’t sticking to green at all. Trying to stand onto the orange volume. Up to green volume and finish. 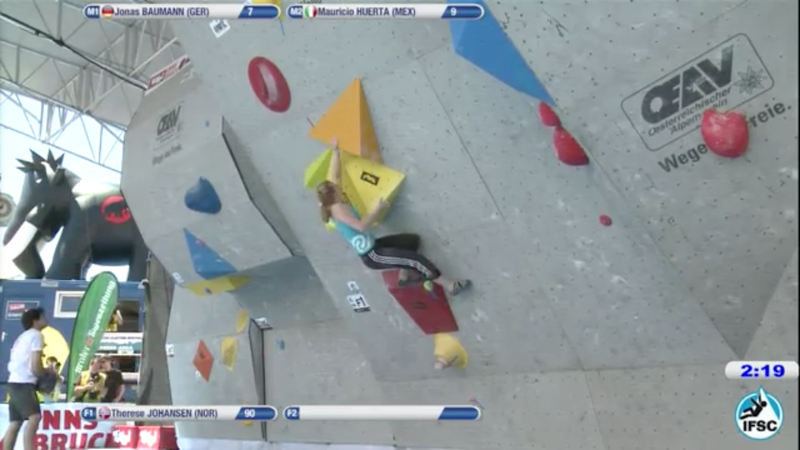 A note: after the first few women climbed semis 1 and 2 a setter came out and tweaked Women’s Semi 4 to make it harder. I think they either changed out or took off a jib on the orange volume. Apparently the setters thought the women were looking too strong and wanted to take steps to better split the field. Therese Johansen especially looked very strong, sending 1, 2, and 3. She’s a strong climber though, and sometimes the first climber will crush and make the setters all anxious and then everyone else will suffer as expected. So was the tweak necessary? Did it work? Or was it too much? See the results below. Wow. Interesting shake up for finals. Anna is cleanly in first here. Jule is in again after 5th in Millau, then 11th in Kitzbuhel and not making semifinals in Log Dragomer. Melissa got 2nd in Log Dragomer and it’s nice to see her in finals again here. Thought it’d be interesting to consider the ages of these climbers. Anna is 25, Jule is 22, and Melissa is 23. The other 3 finalists are all from the same country! 3 Japanese women in finals is impressive, especially since the top-ranked among them (and one of the best in the World, Akiyo Noguchi) is the 6th place qualifier. Akiyo is 23. Momoko Oda is 19 years old and has podiumed many times in International lead events. In 2012 she won an adult Lead World Cup as well as a youth Lead World Championship. 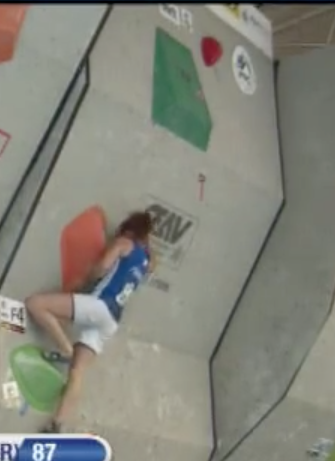 She took 2nd at the first Bouldering World Cup this season in Chongqing. Since then she was 9th in Millau and 10th in Kitzbuhel and Log Dragomer. The new face is Aya Onoe. 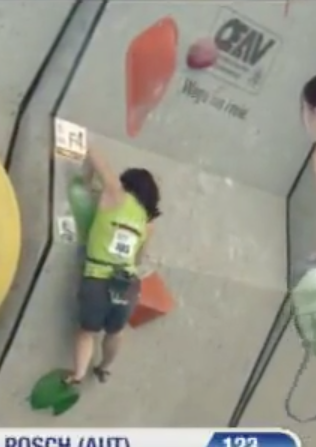 According to her IFSC Results List, Aya is a lead climber, and she’s only 17 years old. 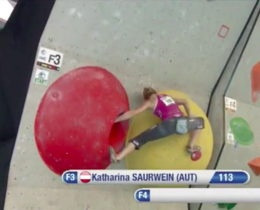 This is her second ever Bouldering World Cup. She took 19th last comp in Log Dragomer. Her previous best finish ever is 5th in a Youth Lead World Championship. For adult lead it was 14th in Korea in October 2012. 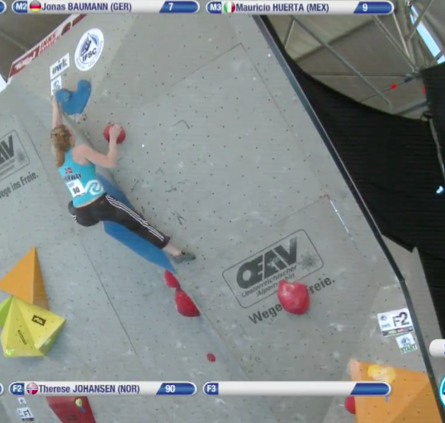 Qualifying 2nd in this Bouldering World Cup signifies a huge step up, and as she’s quite young, we may hear much more from her. Also notable for the women was this strange multi-way tie for 10th. Usually Shauna and/or Alex will be in finals. Katha has been in finals twice this season as well. Petra’s best at an adult comp is 7th, but she’s qualified in 1st at adult comps and also won Junior Bouldering in a European Youth Cup. Clearly the change to problem 4 caused some real trouble for many of the competitors. Six climbers did send it though, so it was probably an appropriate change since it made problems 3 and 4 split up the strongest climbers. 1 & 2 perhaps too easy, 3 & 4 quite hard. First problem was another slab mantle with a taped box serving as the bonus hold. From there you had to do a step across and up with no handholds to get the last hold. Clearly it was delicate, and the volume you stood up (an orange diamond) on seemed challenging as more than one climber suddenly exploded off it and nearly creamed a shin. Sean McColl looking good mid-problem. 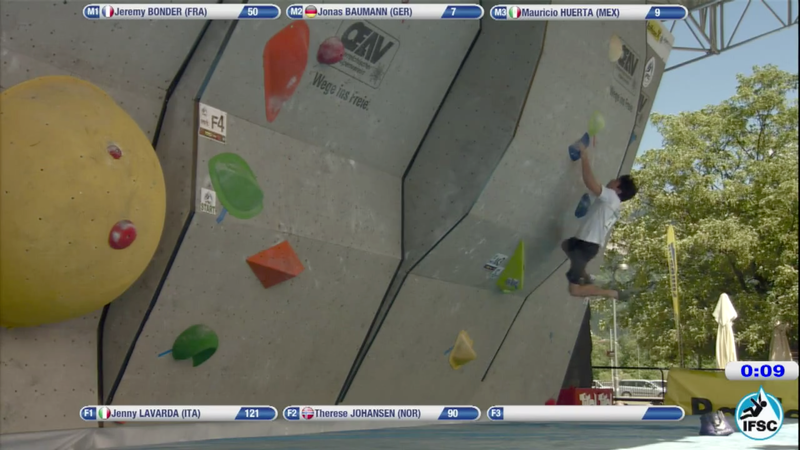 Men’s Semi 2 was a steep little roof followed by a hard move out from the blue triangle volume to the blue blob volume. From there it was foot up, handle the volume, up to small holds on the face and the end. 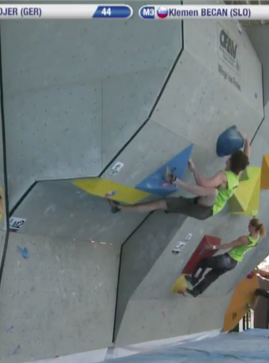 This problem had a sweet 1-2 dyno, or at least that’s what it looked like. Mauricio Huerta staring down the 1-2 on Men’s Semi 3. Start on the volume. Move up right to blue or jump right/left/right, that’s Blue/Blue/Green. If you stick it You’ve got bonus, match, foot up, only two more moves to the end, but nobody but Dimitrii Sharafutdinov did them. Tito Caleyron preparing for the end of Semi 3. Triangle volumes up a slightly overhanging wall. Looked more doable than the others. 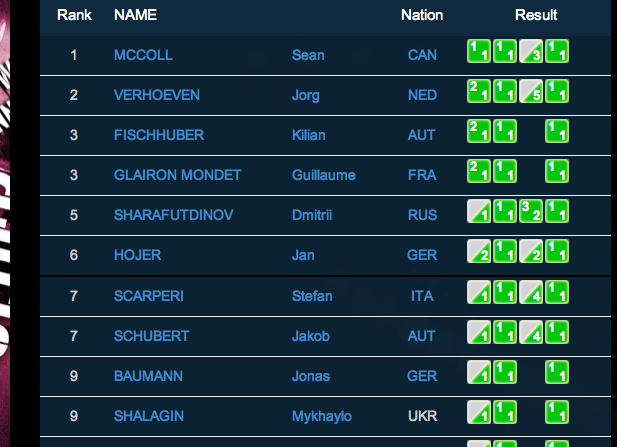 Sean won the last Bouldering World Cup in Log Dragomer, and he looks to be in good position again here. Sean is 25 years old. Just behind him are familiar faces Jorg Verhoeven (27), then Kilian Fischhuber (29) and Guillaume Glairon Mondet (26) in a tie for 3rd. 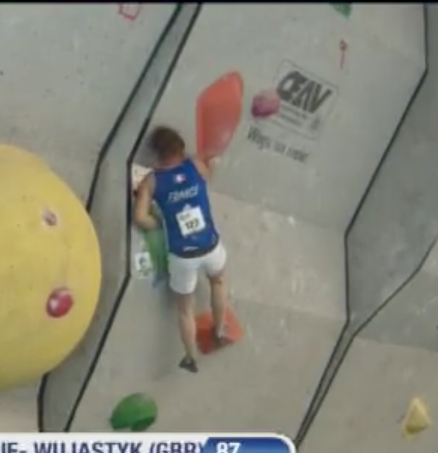 Rounding out men’s finals is the only man to climb semi 3, Dmitrii Sharafutdinov (26), and finally young German powerhouse Jan Hojer (21). 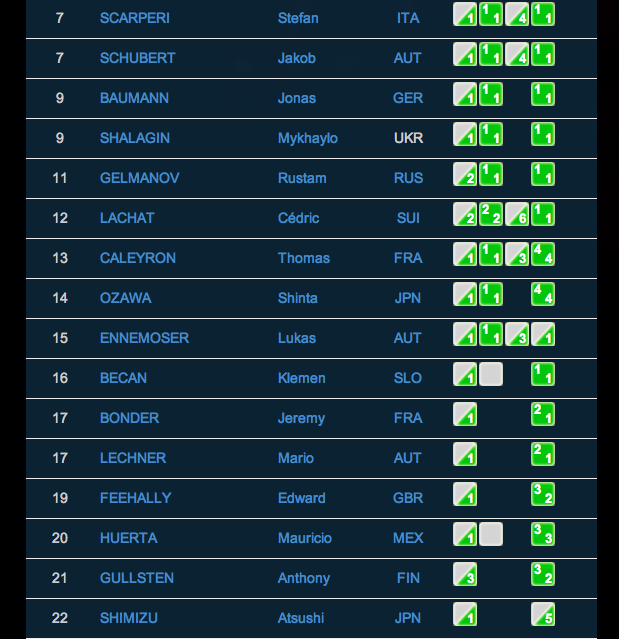 It’s crazy how tries to bonus on 2 of the problems eked Jan ahead of Stefan Scarperi and Jakob Schubert for the last spot in finals. 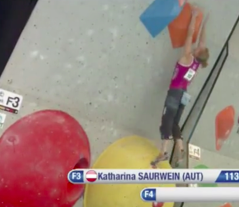 Live feed and link here: Innsbruck – Finals Live Feed! 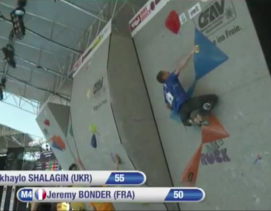 IFSC Bouldering World Cup 2013 #5 – Innsbruck – Women’s Finals IFSC Bouldering World Cup 2013 #5 – Innsbruck – Finals Live Feed!